The time is now that many people are assembling their Christmas menus, and what’s atop most lists? Turkey? Goose? Ham? All fantastic center-points of a Christmas Dinner…but what of the vegetarians? Nut Roasts are certainly a popular option, though for many this means a quick ready-made one from the supermarket which in some cases may as well be cardboard. So why not show a little bit of extra appreciation for the vegetarian in your life this Christmas Dinner and make them an undoubtedly Wintery meal yourself! The beautiful thing about this recipe is it can be rustic as you like, made ahead and it’s full of strong flavours which delicious complement each other, whilst also maintaining that comforting winter feel. Of course you should add any other vegetables or herbs you feel would go well with it! I like to keep it herb free because it’s already got such a flavour punch. 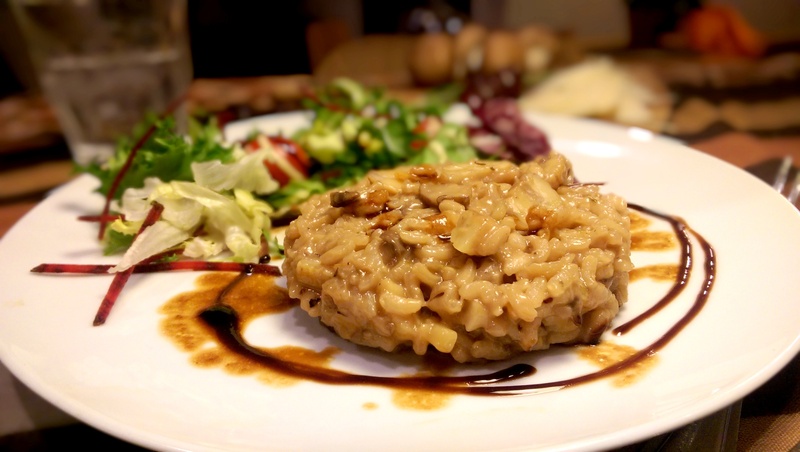 And if it is with a Christmas dinner, the eater may still wish to indulge in the trimmings that everyone else is having, so it’s best not to stuff too many veggies inside the risotto itself. Roast your chestnuts! To oven roast, simply pierce each shell slightly and dry roast for 15 minutes or so at a fairly high temperature. After I remove them from the oven I usually cover with foil for a further ten minutes so that they continue to cook and steam slightly. If you hate yourself you can use pre-roasted. Coarsely chop your onion and fry in a fairly large amount of butter with a little salt in a deep saucepan. I like to do this over a medium-low temperature for a longer period of time. I think it helps the onion flavour mellow and seep into the fat, which will infuse with the rice later. 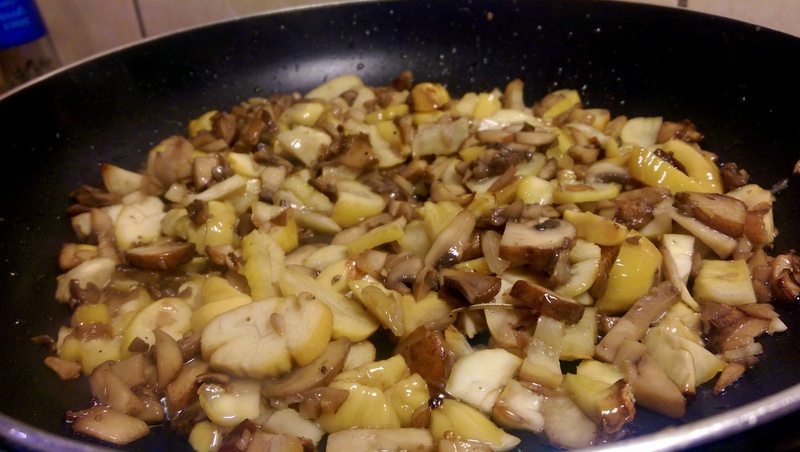 Meanwhile, do the same for your mushrooms – fairly decent amount of butter over a low temperature, until the water has evaporated and the mushrooms sufficiently softened. While both the mushrooms and onions cook, peel your chestnuts, coarsely chop and add to the mushroom pan, frying for a few minutes over a slightly raised heat with a little salt. Add more butter if necessary. Pour around half a cup of risotto rice into the onions and stir well. Add the chestnuts and mushrooms and continue to cook for a few minutes until the grains have turned mostly translucent. Pour in a cup or so of red wine and stir well. When this has been absorbed, add the vegetable stock. Do this one ladle at a time, stir until absorbed, then the next ladle. Continue until the rice is soft with a little bit of bite and the sauce thick. Remove from the heat and grate in a decent amount of parmesan. This will also season the dish, so don’t do so until after you’ve added the cheese. Allow to stand for a few minutes, then serve. Some serve in a bowl, I’m more of a small pile on a plate kinda guy. This is filling on its own, so if serving with accompaniments don’t give too much! 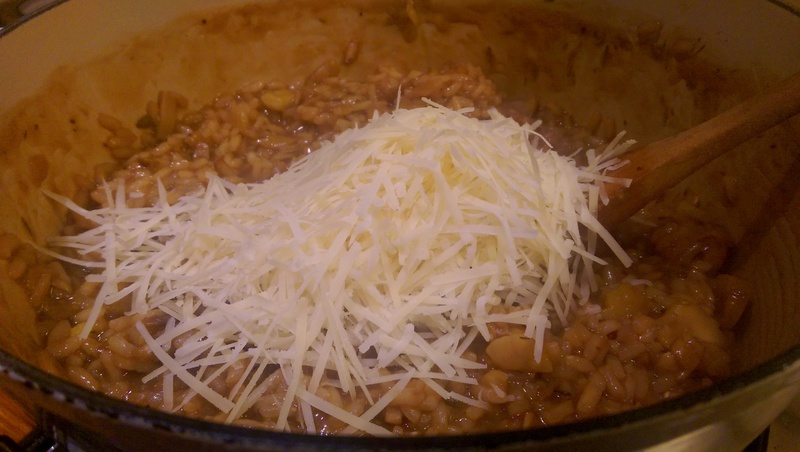 Posted in Guesscipes, One Pot, Starters, VegetarianTagged chestnut, christmas, dinner party, festive, food, gourmet, guesscipe, healthy, italian, mushroom, recipe, red wine, risotto, Vegetarian, winterBookmark the permalink.